PMT Digital offers variable data printing using our state of the art digital presses. Variable data or personalised print is a form of on-demand printing in which text and/or pictures or graphics can be changed from one printed piece to the next, without stopping or slowing down the printing process and using information from a database or external file. For example, a set of personalised letters, each with the same basic layout, can be printed with a different name and address on each letter. 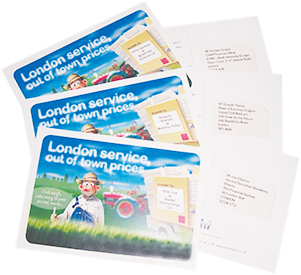 Variable data printing is mainly used for direct mail marketing, customer relationship management, advertising and invoicing on self-mailers, brochures or postcard campaigns.